Grown’s Shannon Allen stops into Foodable to talk cross utilization and healthy, organic fast food. The Mediterranean Vibe can be made into a salad, sandwich or wrap, making these dishes fast and cost effective. What's your vibe? Today on our Smart Kitchen set we welcome grown-woman (Founder of Grown), Shannon Allen. Grown is a truly healthy fast food restaurant. Everything in their restaurants is organic and every meal is available for order through their drive-through windows. Their restaurant is a little different, and not just because of the nutritional information. Grown offers food in accordance with it's "vibes." You can get a salad, a sandwich, or a wrap in one of many "vibes" which are essentially different flavor profiles. And these vibes are just one of the secrets allowing Grown to offer such high-quality meals in less than 4 minutes. 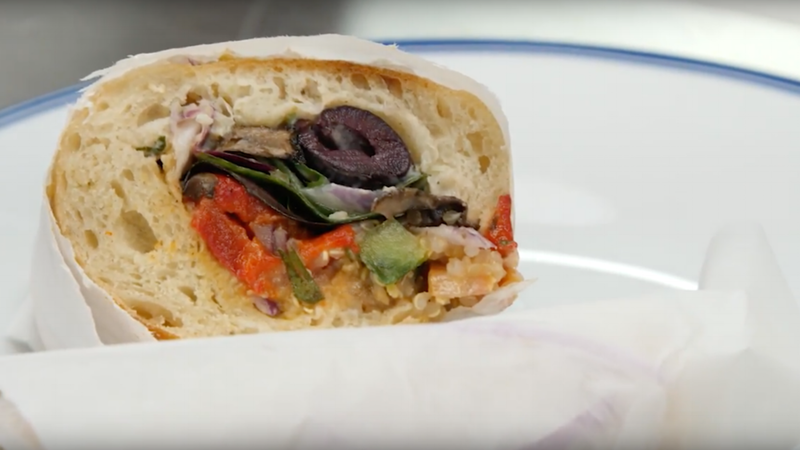 On today's episode, Shannon shows us the Mediterranean vibe and all the delicious, organic ingredients that go into it, while discussing her mission with Paul.